As well as covering some of the typical activities organised by the school, we have also collected some insider tips on what not to miss in Germany’s capital. These are not always the first to appear on the tourist websites, but are still very much worth seeing. Make yourself comfortable, read on, and view the map below to find out where to find these must-sees. We trust that you’re looking forward to your personal journey of discovery through Berlin with Apple Language Courses! The television tower was built in the 1960s by the GDR in the “Mitte” district to symbolise the power and potential of the regime. 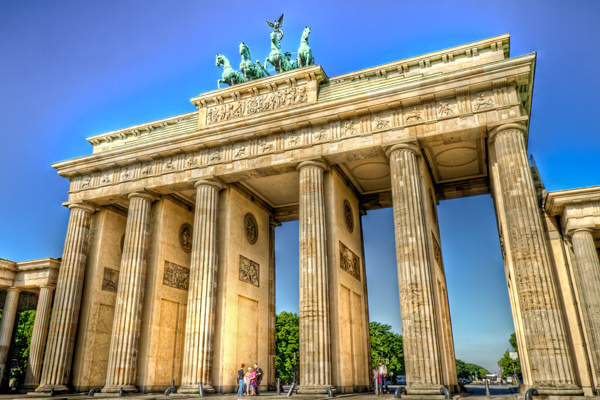 It is now – after reunification and, together with the famous Brandenburg Gate – one of the city’s most noted landmarks. Situated at the famous Alexanderplatz, with a height of 368 meters, Germany’s tallest building is known as Berliner Fernsehturm. 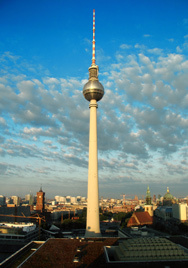 At the top is an excellent viewing platform to catch a breathtaking view over Berlin – there is also a bar up there! You can sit down in the TV Tower Restaurant and enjoy the ambience with a drink, a snack, breakfast, or another meal – just make sure your budget isn’t too limited! Tickets are available at the local sales office but are cheaper on the official website, where you can also find more information on how to get there. Not far away you can also visit the Brandenburg Gate. Built at the end of the 18th century to perfect the vision of King Frederick William II, it truly completes the beauty of the street “Unter den Linden”. This impressive monument has been restored several times after numerous battles in the Napoleonic Era and World War II. The Gate, which resembles the Acropolis in Athens, is considered the centre-point of Berlin and a magnet for millions of tourists every year. The Reichstag building on the “Platz der Republik”, colloquially often called the “Bundestag“, was severely damaged in a fire in 1933. 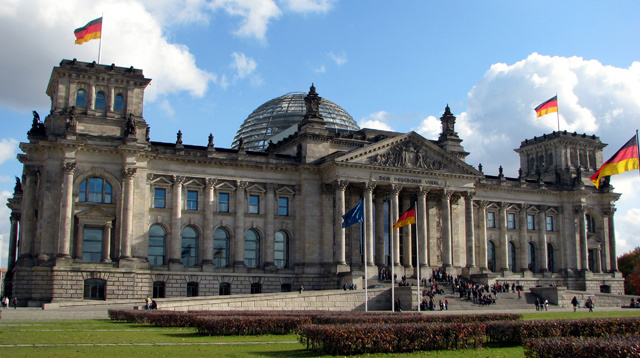 It stood empty until the 1960s, when extensive refurbishment took place; finally finished in 1999, it has been the seat of the German parliament ever since. This impressive building is not far away from Alexanderplatz and can be easily reached by public transport. Its stylistic silhouette is a real eye-catcher, especially with its modern glass dome, located atop the roof terrace. 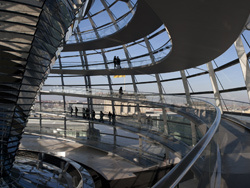 Visitors can access the dome via an internal ramp – if you are interested, you can register online or by mail for various guided tours and visits. You might even witness a plenary session! Anyone interested in the history of the divided city of Berlin should visit the former “Stasi” prison in Hohenschoenhausen. In this memorial, all those who were considered opponents of the communist dictatorship were imprisoned. This included politicians, journalists and public broadcasters, strike leaders, and reform communists. Even ordinary people who just wanted to flee to West Berlin, or only considered fleeing, were held here. See for yourself the dark side of this regime and take part in a guided tour through the prison complexes. Listen to unimaginable stories from the prison’s torture chambers and interrogation rooms. Tours are generally given in German, but other languages are available. 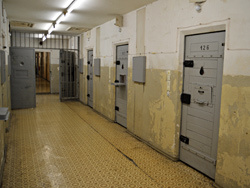 Many guided tours are accompanied by contemporary witnesses and even former prisoners, who tell their own stories of the place, giving the experience its authenticity. For a slightly more active version of the journey of discovery, take a bicycle tour along the traces of the Berlin Wall. This is a great opportunity to learn a little more about Berlin’s history in your free time. Ride along the former border strip past Wall remnants, former border crossings, one of the last watchtowers, and other traces left behind by the division of the city. You will also pass important locations such as the Mauerpark, which is used as a venue for flea markets and other events. The park is treasured by locals of all ages, who mainly use it as a central meeting place. Your rental bike and all necessary accessories are included in the price of the tour. You will need a helmet and gloves and perhaps a coat or rain poncho in case of bad weather. This excellent tour is also offered in several languages if required. The Fête de la Musique is an open-air summer music festival that has been celebrated in Berlin since 1995. It takes its inspiration from the French festival of the same name and is completely free to attend! The festival invites amateurs and professional musicians of all styles to celebrate their craft and prove their skills to the general public. Numerous stages are set up in all districts, with music playing between 16:00 and 22:00. The local clubs and bars continue the festivities and live music well into the night. Another increasingly popular live music festival is the famous Lollapalooza, which welcomes artists and bands from all over the world on the second weekend of September each year. Genres include hip-hop, electronic dance, house, alternative rock, heavy metal, punk rock, and pop. It’s advisable to order tickets well in advance, as demand is always increasing and the number of tickets are limited. You can enter your e-mail address on the Lollapalooza homepage to be informed in time to grab your tickets when pre-sales open. Since September 2018, the Lollapalooza festival has been held in the Olympic Stadium and the surrounding Olympic Park. This venue is also home to numerous concerts by famous musicians throughout the year. These include Beyoncé and Jay-Z, who performed with particular pride – due to the stadium’s history – in summer 2018. Fans were reminded of a special event that took place in this stadium 82 years ago. 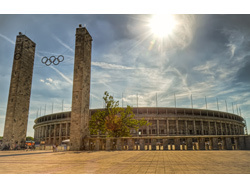 The Olympic Stadium, which was built by order of the former Reich-Chancellor Adolf Hitler, was the scene of the XI Olympic Summer Games in Berlin in 1936. Both the Stadium and the Games were heavily used as propaganda instruments by the regime to portray Germany positively and powerfully abroad. They succeeded quite well until the outstanding performance of the African-American athlete Jesse Owens who, in winning four gold medals, gave the games an ironic twist. His achievement went down in Olympic history and helped undermine Hitler’s myth of ‘Aryan superiority’. Today the stadium is primarily home to the ‘Hertha BSC‘ football club, which uses it for games in the German national league, Bundesliga. 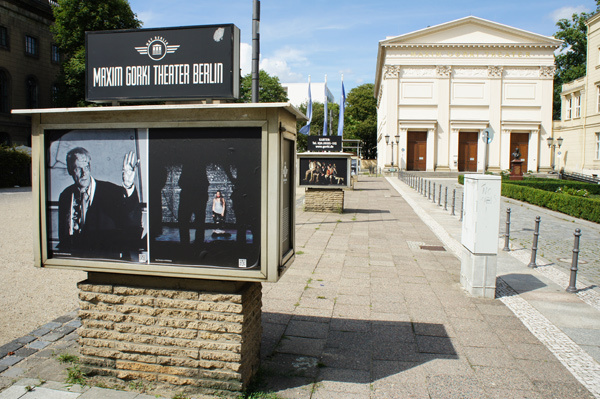 If you are searching for a somewhat different, culturally-valuable stage presentation, you should check out the Maxim Gorki theatre. This theatre specialises in stage plays with socially and politically critical content, and offers a great way to enjoy a different – sometimes polarising – type of night out. A visit to the Maxim Gorki always encourages reflection and deeper thinking from the audience. If German is not your native language, the screened English subtitles for each performance will probably be very convenient for you. It is always best to check online in advance whether they are offered, especially for a performance you might be interested in. Are you looking for shops that offer beautiful seasonal clothing for the low to medium budget? 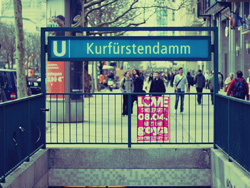 Then Alexanderplatz is the place for you! Around this square you’ll find numerous shops that can offer you what you are looking for, including Primark, C&A, TK Maxx, and many more. You will even find numerous restaurants and cafés such as Starbucks on Alexanderplatz. Take a break to recharge your batteries before exploring the next famous shopping centre: The Alexa. This centre, opened in 2007, is the second largest in Berlin. It is located southeast of Alexanderplatz, just a few minutes’ walk away. The variety of shops provides you with everything your heart desires, and makes for a great place to go window-shopping! For even more choice at affordable prices, but especially for exclusive luxury fashion boutiques, Kurfürstendamm is the place to go. It defends its title as Berlin’s most famous and popular shopping mile each year, boasting a whole 3.5 km of shopping boulevard. The icing on the cake of the high-end mile is the Kaufhaus des Westens, popularly known as “KaDeWe”. This is where the hottest brands of the luxury segment – such as MCM, Armani, Balenciaga, Burberry, Chanel, and more – are concentrated. For the absolute highlight try the gourmet department. On the 6th (out of 7) floor you have the opportunity to taste international delicacies, cakes, and a large selection of wines and champagnes. In addition, there are of course restaurants and cafés all around. Choose between burgers, fish, typical Berlin dishes, the oyster bar, and many fine specialities. Guten Appetit! For tasty, authentic, traditional German food you should visit the restaurant Zum Schusterjungen in the district of Prenzlauer Berg (it’s only a 10-minute walk away from our school, so ideally placed for an after-lesson snack!). The staff are well-known for their hospitality and the fare is quite affordable. You can even sip a cool beer while you wait! In the same part of town you will also find one of the best currywurst shacks in town, called Konnopke’s Imbiss. This fast-food place has been around for 80 years and is said to be the first snack bar in East Berlin. Situated directly under the railway tracks, the scenery contributes a great deal to the atmosphere of the experience – it’s a definite must for anyone new to the city. The district of Prenzlauer Berg is well known for its countless restaurants, pubs, and bars. Whilst there – or anywhere in Berlin, for that matter – you should definitely try a real ‘Berliner’ doughnut, made fresh from a local bakery. 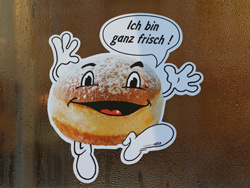 Berliners are fist-sized fried yeast dough balls with a filling of jam, coated with refined, powdered sugar or icing. Although these pastries are sold throughout Germany, they always vary slightly depending on the region. A variety of jam and sugar are often used, so each one is slightly different. They are quite similar to American donuts in both preparation and taste, but should not be missed from your unique Berlin experience. We hope that with this information we have been able to give you an insight into things to do in Berlin, its culture, and its interesting sights. We wish you a wonderful journey of discovery on your next German course in Berlin!